Altigen’s Professional Services team helps you maximize the capabilities and benefits of your MaxCS PBX system. Our team has nearly twenty years of successful experience in developing software applications and integrations, such as CRM screen pops, database-driven call routing, customer IVR workflows, and many more custom communications solutions. Our team of professionals are trained software developers, using the latest methodologies and industry standard APIs to create custom applications and integrations. 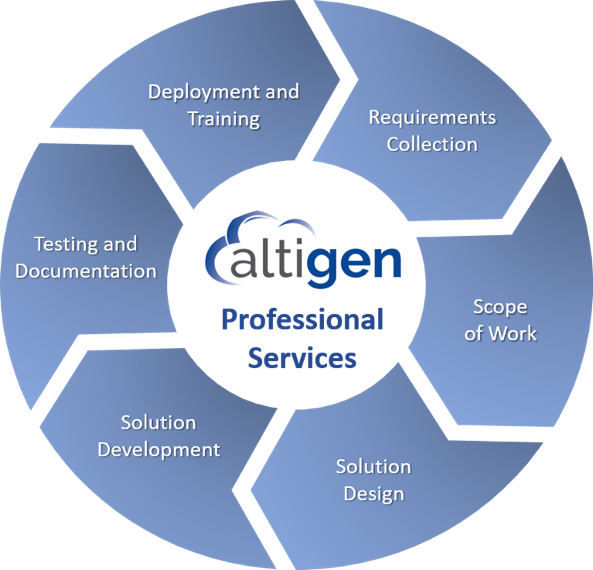 If your company needs to extend MaxCS to address your unique business requirements, the Altigen Professional Services team is here to help. Requirements Collection – We’ll start by discussing your needs with designated customer representatives in order to identify and collect all business and project requirements. Scope of Work – Once Requirements have been reviewed and agreed upon, we’ll create a clearly defined scope of work (SOW) and detailed quotation for your review and approval. Solution Design – Based on your acceptance of the SOW, our PSO engineers will begin designing your solution, then submit the design for your approval. Solution Development – Upon approval of the Solution Design, our PSO engineers will begin the custom application development or integration project. Testing and Documentation – Once the development is completed, the solution will be thoroughly tested by our quality assurance team and technical documentation will be created. Deployment and Training – Our PSO engineers will deploy the solution once it has passed our quality assurance testing. In addition, we’ll provide training for your administrator and users, if applicable. Requirements Collection – Our professional services team will discuss your needs with you and collect the requirements for the project. Scope of Work – Once our PSO engineers understand your requirements, they will create a scope of work and quotation for your approval. Solution Design – After we receive approval of the S.O.W. and quotation, our PSO engineers begin designing your solution based on the APIs available for your customization or integration requirements. Solution Development – Our PSO engineers will begin the custom application development once the PSO manager signs off on the solution design. Testing and Documentation – After the development has been completed, the solution is thoroughly tested by our quality assurance team and technical documentation is created. Deployment and Training – Our PSO engineers will deploy the custom solution once it has passed our quality assurance testing. In addition, we will provide training for your administrator and users if applicable.